WineHQ Forums • View topic - Ubuntu 18.04: stuck on "Running /usr/bin/wineserver -w"
Ubuntu 18.04: stuck on "Running /usr/bin/wineserver -w"
Post subject: Ubuntu 18.04: stuck on "Running /usr/bin/wineserver -w"
Any ideas? Thank you very much! Post subject: Re: Ubuntu 18.04: stuck on "Running /usr/bin/wineserver -w"
Just to make sure, you clicked ok, right? Open the taskmanager to see what wine processes are running. If you want you can kill them with "wineserver -k"
yes I clicked ok but it seems it's on an infinite loop. 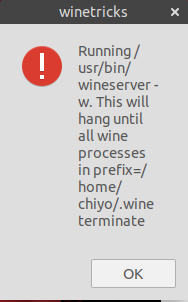 Well I would've thought "ps aux | grep win[e]" would list all any processes with the word "wine" in it. In any case, I "CTRL-C" to stop winetricks and tried "wineserver -k" and then run winetricks again. no difference. edit: Seems the infinite loop only happens on some fonts. I was able to install Tahoma font. Well I would've thought "ps aux | grep win[e]" would list all any processes with the word "wine" in it. Well, it does. But not every process started from wine does have "wine" in its name. Just try running "wine notepad" and then "ps aux | grep win" - you won't find it like that. In any case, I "CTRL-C" to stop winetricks and tried "wineserver -k" and then run winetricks again. no difference. I didn't mean it like that. Don't CTRL-C, just let winetricks wait, and in parallel run "wineserver -k" to kill the processes winetricks is waiting on. While not very nice, this should help get it further. Although an endless wait is probably a bug with winetricks. doc static-libsWell I would've thought "ps aux | grep win[e]" would list all any processes with the word "wine" in it. in a different terminal session / tab (with your WINEPREFIX variable exported first). If your issue is reproducible, you should probably report it on the Github: winetricks Issue Tracker.